Today, May 21, is the birthday of Adamus “Adam” Börner. He was born in Gaulsheim, Germany in 1823, and was, I believe, the son of Henrici Josephi Boerner and Katharinae Erschfeld. Adam married Anna Maria Jenz and they lived their lives in Gaulsheim. They were written about in an earlier post. This picture of their gravestone was sent to me by Christa, one of my Boerner cousins in Gaulsheim. I am grateful for her research, her willingness to share it, and for the gift of the Internet opening up such great relationships! 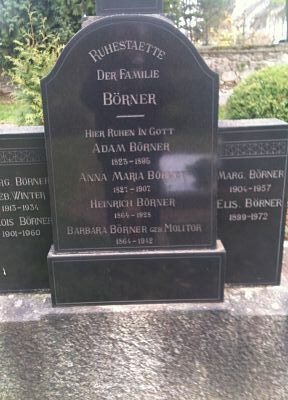 Gravestone of the Börner family in Gaulsheim.